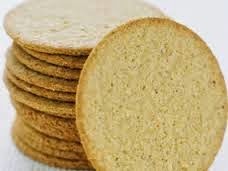 How great are oatcakes?! I mean, kids love them, adults love them, dogs love them (well, I'm not sure about that one but they probably do). And they are just so healthy. Honestly, I love that, when Max, my four-year-old is peckish, I can whip out a little packet of these without feeling a smidgen of guilt and he genuinely loves them. I don't have to do any bribing at all to get him to eat them. And we all know oats are slow release carbs so won't give him any freakish highs come snack time and make him jump all over the sofa. So as I was doing my last online shop and ordering another two or three boxes of the stuff, I thought about maybe trying to make some instead ( I KNOW, right?) and I mixed and mashed a few recipes together and I did it! And you know what? They're pretty great. So I thought I would share this with all you mums out there who always have an opened packet of oatcakes crumpled up at the bottom of your changing bag. Have a look, I bet you do. These are easy, won't take more than 15 minutes to get together and honestly, they taste really good. Even my husband thought so. These are cheese ones but obviously, you could leave the cheese out or, I'm even thinking of adding a few dark chocolate chips next time for super healthy sweet treats. Oh Gwyneth would be proud. 2. Mix your oats and flour together and stir in the cheese really well - you don't want any clumpy bits. 3. Drizzle over the oil and add the water then mix it all together until you get a sticky dough. 4. Sprinkle some plain flour onto a table and roll out your dough so it's about 5mm thick. 5. Cut out your shapes with a round pastry cutter and place on a greased baking tray. 6. Bake for 10 to 15 minutes until lightly golden. 7. Leave to cool, enjoy and store any left overs in an airtight container.